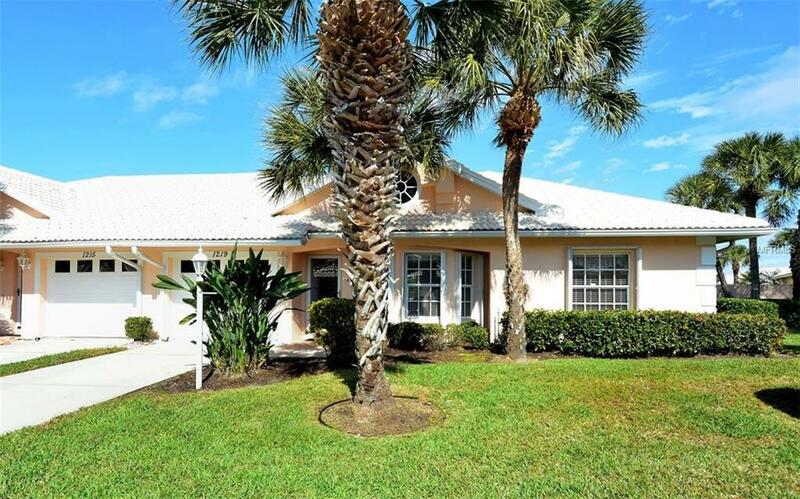 Sparkling clean 2 Bedroom, 2 Bath, 1 car garage villa located in the gated, maintenance free Berkshire Place neighborhood of Waterford; a championship Golf & Tennis Community. Open concept floor plan with vaulted ceilings in the living/dining room area. Updated GRANITE countertop and sink faucets in the kitchen with glass tile accented backsplash. The Kitchen cabinets have lighting both under and above them adding ambience. Lots of natural light from the glass screen front door, beautiful bay window and patio sliders leading to the EXTENDED lanai. The very PRIVATE lanai has lush tropical landscaping and views of palm trees and the well maintained community green space on one side. The lanai floor has an epoxy coating with attractive neutral paint flakes similar to the garage floor. Both bedrooms have updated laminate flooring with a hardwood look. Tile found throughout the rest of the villa. Inside Laundry. Convenient, easy to close accordion hurricane shutters on all windows. A/C and water heater are just 3 years old. The HEATED community pool is a few doors down the street. PLUS all these amenities of the Waterford Sports Club are available to you as well: junior Olympic community pool, spa, fitness center, 4 lighted Har-Tru tennis courts, Clubhouse and restaurant. Golf membership is optional. Close to walking trails and Venice Island with it's gorgeous beaches, delicious restaurants, boutique shops, Waterway/Legacy bike trails and more. Sold furnished and ready for you to move in and start having fun!